Vladimir—nom de guerre “Zahar”—a medic from the Azov Regiment, speaks with women delivering meals to wounded soldiers at the Mariupol hospital. The hospital here is no exception. The faces of soldiers, both young and old, recovering from wounds and sickness incurred on the front lines — located only eight miles away from here — speak to the innumerable contradictions of war. Some are smiling and joking, enjoying the camaraderie of being in open-bay recovery rooms with up to six of their comrades. They sing patriotic Ukrainian songs like they’re in the stands at a soccer game. Yet others, even while surrounded by fellow soldiers, stare ahead numbly. Eyes fixed on the cracking off-white paint of the tired Soviet hospital’s walls, or out the window at the grey, rainy day; the sounds of artillery rolling through like thunder. They’re not looking at anything in particular, their minds locked in another time and place. They frown and look away when asked questions or become defensive when photos are taken of them. “No photo, no photo,” they say, wagging their fingers disapprovingly. They smile for the camera but insist they be given time to put on their uniforms and show off their unit patches. It takes a few minutes for those with serious injuries to slip on their jackets as they gingerly work around bullet or shrapnel wounds. But the proud ones are eager to oblige. This day is special, after all, for the nearly 50 Ukrainian soldiers at the Mariupol hospital. On this rainy early April evening four women from the city have come to bring the soldiers warm meals and sweets. It was their first time personally interacting with the soldiers sent to defend their city, and the reactions of Tamara and Margarita Oksanichenko, Helen Popova, and Valeriya Korneva to the wounded men highlight the evolving relationship between Mariupol’s citizens and the soldiers sent to defend them. “I didn’t know what to expect,” Margarita Oksanichenko said. “We had to do something,” Korneva said. “Plus, they need a mom to check in on them,” she added. Upon entering the hospital, the women disrupted the status quo. They were talkative and noisy; their conversations bounced off the worn-out tile and linoleum floors, carrying down the dimly lit hallways. They earned annoyed scorns from hospital staff, who, still abiding by strict rules of procedure dating from the Soviet era, were displeased with groups of visitors roaming through the halls handing out goodies. One nurse, an older woman wearing a stained blue and white uniform and white cap, initially told the women they weren’t allowed to see the troops. She eventually relented, though, after the smell of home-cooked food attracted a few nearby soldiers who offered to act as guides. 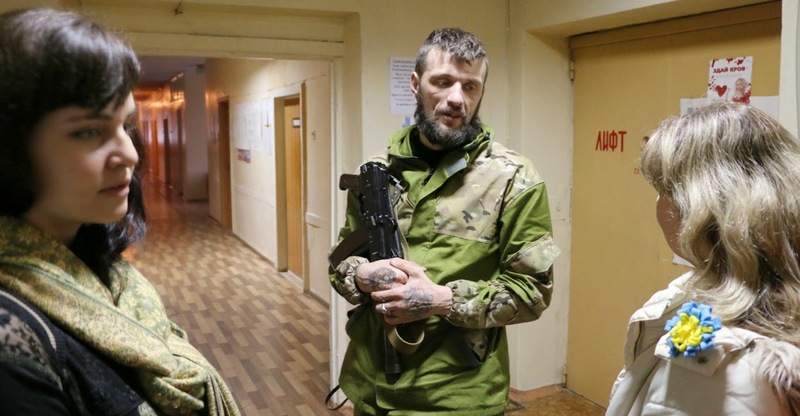 One of those soldiers was Vladimir—nom de guerre “Zahar”—a medic from the Azov Regiment. He distributed plastic booties—most of which were caked in dirt and worn through in the soles—for the women to wear over their shoes. “We have to be careful of spreading infection,” he explained. As Vladimir talked with the women, he cradled a Kalashnikov assault rifle in his tattoo-covered hands. He had a full beard and thin piercing eyes, as well as the standard Azov Regiment haircut: hair closely cropped on the sides, combed forward on top. He spoke about combat in a quiet, understated way, as if no part of what he had experienced was all that remarkable. “Medics are very important soldiers on the battlefield,” he said, while pointing out that he was also an infantryman. He said individual first-aid kits donated by volunteers in the United States and Canada had improved the survivability of wounded soldiers. “One medic can now take care of 10 people,” he said. He also said NATO instructors had visited the units in Mariupol, training the Ukrainians in self-aid, giving them the skills to dress their own wounds without relying on a medic. But the biggest challenge was getting the soldiers off the battlefield and into medical care quickly. Without the possibility of helicopter medevacs due to the surface-to-air missile threat, and with armored vehicles at a premium, battlefield evacuations are often done in donated civilian cars. Some Mariupol residents have even volunteered to ferry wounded from the battlefield, braving heavy weapons attacks in old Ladas and Hyundai hatchbacks. Vladimir led the women to the first room, where four soldiers lay in bed. The two men nearest to the door both sat up when the chit-chatty group of women burst in. The two in the beds at the far end by the window were covered in bandages and casts and could only curiously raise their heads at the unexpected spectacle. The room was dimly lit, humid and had the musty smell of clothes and sheets that hadn’t been washed in a while. As if walking into a breaking wave, the demeanor of the women changed the moment they passed the threshold of the door into the room. A hush fell over the group. Since last summer, more than 1,000 soldiers have been deployed to Mariupol to defend the city of half a million residents from a separatist attack. But the soldiers have mostly stuck to their barracks at the Mariupol airport, or out at the defensive perimeter of trenches and hardened positions built around the city like a fortress wall. Last April’s separatist takeover of Mariupol has some Ukrainian commanders worried about inadvertently sparking an incident that might reignite civil unrest. Soldiers, therefore, spend very little time interacting with civilians and are infrequently seen on Mariupol’s streets. Military convoys zip through town, mostly at night, avoiding stops as much as possible. The Ukrainian military’s sparse footprint inside Mariupol is also meant to spare civilian casualties if the separatists launch an all-out attack on the city. “We have two priorities: Defend the city and save the population,” said Ukrainian National Guard Capt. Ruslaw Muzychuk in an earlier interview. Consequently, like most people in Mariupol, the four women had hardly interacted with any of the soldiers sent to defend them. Except at checkpoints where the soldiers are armed and edgy, and usually wearing a balaclava to conceal their identity. Now they were up close with the men, who were no longer standing tall in their uniforms with weapons slung over their shoulders, but lying helpless in a hospital bed in plaid flannel pajamas. The women handed out food to the soldiers. And then, one by one, the women began to cry. The four soldiers, only days removed from the gritty battle for Shyrokyne, seemed shy and reserved, showing the dutiful respect a young man might show his mother. The two who could sit upright had their hands folded on their laps. The women, for their part, slipped into familiar habits. Korneva, 49, (who has two grown sons) sat beside Oleg—nom de guerre “Sukhar’”—a red-bearded Azov soldier in his early twenties who was wounded near Shyrokyne. As he talked, Korneva put one hand on his knee and used the other to wipe tears from her eyes. “We’re so proud of you boys,” she said. Oleg’s battlefield nickname comes from the Russian word for a piece of dry bread. He said he got the name from his friends because he worked in a bakery before joining the regiment. He was anxious to get back to fighting. “We will go back soon,” he said. Another Azov soldier in the room, Artur—nom de guerre “Gimli” (after the dwarf warrior from Lord of the Rings, whom his friends think he resembles)—said it was “pleasant” to see the women there. He then segued into a conversation about how much better American MREs were than Ukrainian battlefield rations, eliciting enthusiastic nods from the other soldiers. Quesadillas with cheese were his favorite. Led by Vladimir, the women went from room to room in the hospital, delivering food, and taking a moment to chat with each soldier. Some of the wounded seemed like they were hardly hurt at all, standing upright, pacing in their rooms. One soldier even picked up Korneva in a big bear hug. But other injuries were less concealed. A 22-year-old Finnish soldier from the Azov Regiment was wheeled into one of the rooms as the women chatted. A nurse lifted him into bed. He had only been in Ukraine for a month before artillery shrapnel tore into his legs in Shyrokyne. He was adamant that his name not be used or his photo taken. He wasn’t scared of the enemy discovering his identity, only that his mother back in Finland would find out he was fighting in Ukraine and become worried. “I wasn’t lucky to get hurt so soon,” he said. In one room, which was relatively spacious with only three soldiers occupying it, an intelligence officer from the Donbas Battalion named Igor—nom de guerre “Monolit”—pulled out his cell-phone and flipped through photos of him and his men on the front lines in Shyrokyne. He was particularly proud of a photo of him holding a sniper rifle. The women crowded around to see. Lying in bed as Igor showed his photos was Vadim—nom de guerre “Bird”—a machine gunner for the Donbas Battalion who was bald and looked older than most of the soldiers. He had been shot through the lower back. He didn’t want to give his last name, but he wasn’t shy about being photographed. He painfully sat up and put on his uniform jacket for a picture, insisting that the Donbas Battalion patch be visible. “We are fighting for our motherland and no enemy will pass,” Vadim said as the photo was taken. Afterward he painstakingly took off his jacket and got back in bed, lying on his uninjured side. Room after room the women delivered their meals. As they wandered the hallways, curious faces poked out from doorways, and frowning nurses stood at intervals along the walls with arms crossed. The men they visited were from a patchwork of military units, underscoring the cobbled-together defense of the city. They were from the regular Ukrainian army, marines, special forces, National Guard, and civilian volunteer battalions like Azov and Donbas, which have only recently been incorporated into the Ukrainian National Guard. The men were mostly young, usually in their early to mid-twenties. Although, there were a few men in their thirties and forties. Vladimir spoke proudly about the women who served as medics in some of the units, declaring they were just as brave as the men and fierce fighters in their own right. But there were no injured women in the hospital on this day. Near the end of the visit, the women stopped in a room that held six soldiers. They were a mix of National Guard and Ukrainian marines. And there was one older man at the back of the room smoking a cigarette. He wore all black and had on black leather cowboy boots. He said he was from an intelligence unit, but declined to give more details. The room was packed with both men and stuff—uniforms and bags of personal items were scattered around in piles. The soldiers were thankful for the visit and the food, and they joined the women in singing the Ukrainian national anthem. One of the National Guard soldiers, who declined to give his name, said he was relieved to see that kind of support from the local population. A few days ago he had been turned away from a café downtown because he was in uniform. “They told us we had brought the war here,” he said. Mariupol is a divided town. According to an October 2014 poll conducted by New Mariupol, a pro-Ukraine civic group, 75 percent of the city’s nearly 500,000 residents support remaining a part of Ukraine, while 25 percent support separating and becoming part of Russia (many of those in Mariupol who support separating from Kiev see joining Russia as the best alternative, not forming or joining a breakaway republic). Although, in private conversations and around dinner tables many people in Mariupol admit that the percentage of people who want to split from Kiev is much higher, perhaps even the majority. “But those are the people who are just waiting for help,” said Popova, a university professor. Mariupol’s divided loyalties (provoked by Russian propaganda and intelligence operatives, some residents claim) spurred an uprising that began in April 2014, in which separatists briefly took over the city. The Ukrainian military re-established control in May after weeks of deadly skirmishes that left the city administration building and police headquarters in ruins and at least 50 people dead. Pro-separatist leaders claimed the number killed was much higher, a charge Kiev denies. Since last year’s uprising, Mariupol has remained a key objective for the separatists. Their stated reasons for taking the city range from establishing a land connection from Russia to the breakaway region of Crimea, to remaking Novorossiya, an allusion to the 18th century Russian empire of Catherine the Great. When the four women left the hospital, their conversation was notably more subdued than when they had entered. For them, up until this point, the evidence of war had mostly been its sounds. Now the visual evidence of broken young bodies and the distant looks on some of the soldier’s faces offered the women more poignant proof of the sacrifices made by those sent to defend them.